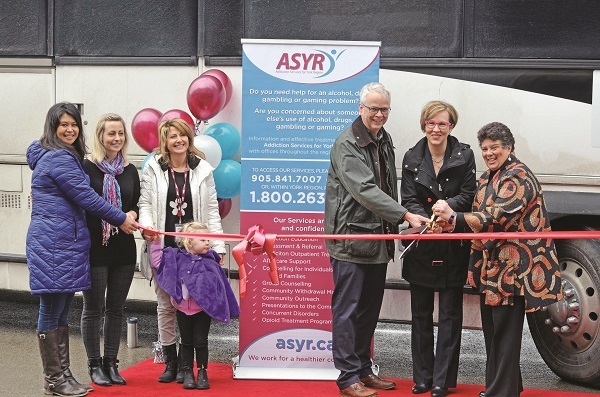 Addiction Services for York Region is getting to the heart of the problem with the launch of a new travelling clinic that will hit many of our community's hotspots. Following Monday's launch, the bus was headed immediately to its first few stops in Sutton and Pefferlaw, followed by stops in Woodbridge and Newmarket later this week. A full itinerary will be posted each week on their website at asyr.ca. Excerpt: Addiction Services for York Region is getting to the heart of the problem with the launch of a new travelling clinic that will hit many of our community’s hotspots.